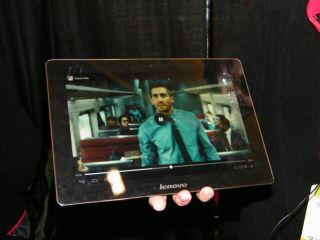 Lenovo has really gone to town at CES 2012 and made Sunday's traditional build up to press day its own. The Chinese company has debuted new Ultrabooks and ThinkPads as well as showing off prototypes. But pride of place was this tablet - the Asus Transformer-alike IdeaPad S2. Weighing just over 1Kg with a keyboard dock, the 10.1-inch device runs Android 4.0 Ice Cream Sandwich. The tablet itself is extremely thin, but with the dock this becomes a couple of centimetres in depth. The tablet slots securely into the dock, which gives you a utilitarian keyboard to play with and transforms the device into something that much more closely resembles a netbook. The tablet boasts 10 hours of battery life anyway, but with the dock this is doubled to 20 hours as the keyboard has a battery slice underneath. The dock also gives you USB ports so you can plug devices into the S2. Swimming against the tide, the device isn't quad-core, instead running the powerful 1.5GHz dual-core Snapdragon S2 MSM 8960, which should mean that pricing is competitive. The IPS display has a 1,280 x 800 resolution. Sadly there's no word on cost as yet, but the Lenovo representative revealed that the IdeaPad S2 release date is set to be the second quarter of the year.